No such thing, but some are better than others at the job they are designed for. 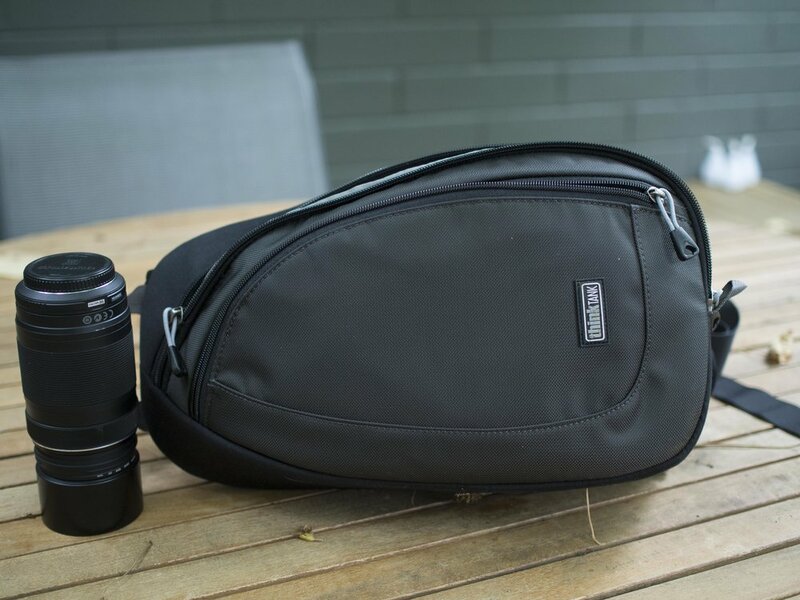 The light travel sling bag has been on the radar for awhile. I know as well as anyone who shleps gear all day that even a few kg on the shoulder seems to double in weight over a day. Heat or cold force tough decisions, as do places where going unnoticed and out of the way is important. Shoulder bags have their place, but travel is not one of them. The TT Turnstyle 10L (chosen as the best fit for me out of a 5L and 20L) in Charcoal fits almost all of my needs perfectly. 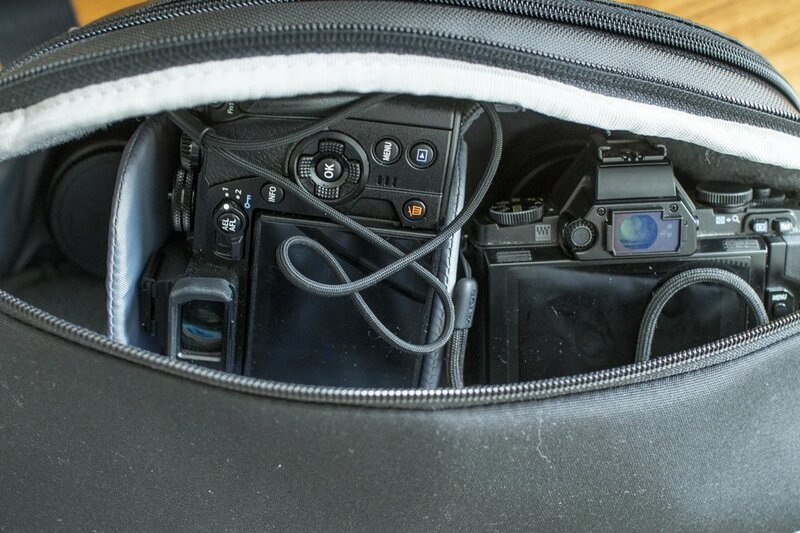 The main compartment holds bigger M43 gear (EM1 with 12-40 or 12-100), a second body with/without mounted lens and a third lens option. All are in the “ready to go “ configuration, so not reversed hoods or caps needed. EM1 with 12-400, EM5 with 75mm and little prime on the end. Deceptively tall, accommodating my 75-300 easily and any other lens but that one mounted on a camera. The internals are divided by three tall and one short divider (one removed for this kit and the small one on the floor for added cushioning). They are thinner than Lowepro ones, but stiffer and more padded than Domke. The velcro is very tight and grippy, not the sort that will fuzz up with repeated changes (like a Billingham insert). A small Billingham 2 lens box divider will fit in one section also for an all primes day. Almost a deal breaker for me, the rear padded ipad pocket will hold an ipad mini, but only “naked”. Mine is on a protective case and would not fit. This pocket is however ideal for sensitive documents being the nearest contact point to the body and well hidden. Then I discovered the bigger internal one. All sorted. This could hold a naked full size ipad. The front pocket will hold several small items like a phone, note pad, pen, map, batteries, cards etc. It is flat, but roomy. The broad and very comfortable strap runs up-down when worn at the back and makes the bag feel effectively weightless. I am not sure a fully loaded 20L would feel the same, but it would definitely feel lighter than a shoulder bag. 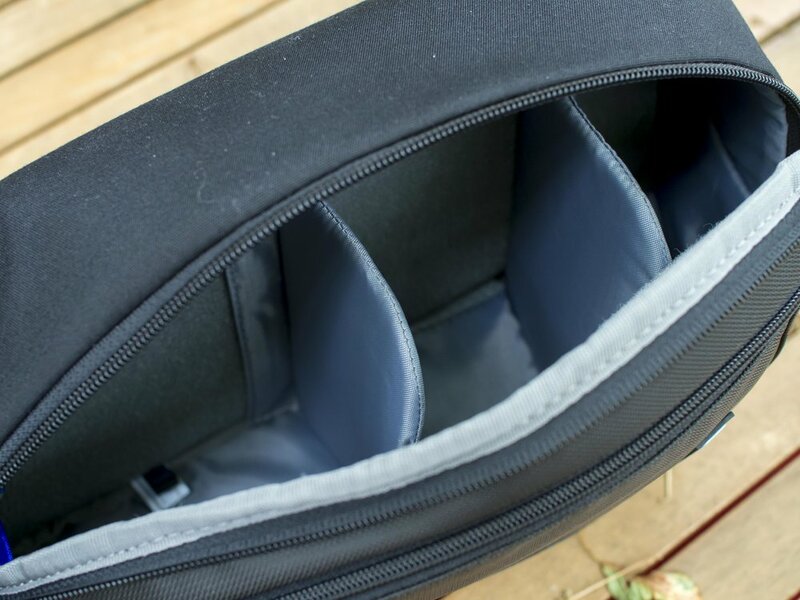 The strap is easily adjustable which is good as the bag feels better when tighter-higher up the back, but a lower sit gives more “swing around” room when fiddling with gear. The only thing I would add is a small strap anchor for an optional phone or utility pouch to be placed on the front. A handy top strap. The bag stands up well when full, if loaded sensibly. The optional stabiliser strap and rain coat pocket. I will remove the strap as the bag will not be used for extreme sports. This can also be used to turn the bag into a fanny pack. It would also allow for small utility pouches or a water bottle pouch to be added. Overall the bag feels better finished than many others I have tried and has the feel of long-term sturdiness that is reassuring. It is also nicely classy in a low profile, modern street kit way. Not only is this bag ideal for a small kit over long distances, but it manages to become effectively invisible when not in use.